Be they working dogs, show dogs, or common domestic pets, are there any benefits to a corded coat for these breeds? What are the potential risks and rewards, both for dog and owner, to looking like a household cleaning implement? Let’s take a closer look at each dog in turn. Our first breed, the Bergamasco, traces its origins to the Italian Alps, around the province of Bergamo, just north of Milan. Where most of the dogs we’re looking at here are double coated, this herding dog’s coat is composed of three varieties of hair. It has two undercoats, one that is short and slick, and another that is longer and more wiry. The top coat is curlier and has the consistency of the sheep it customarily looks after. With a typical lifespan of 15 years, it takes a full year before the strange-looking coat even begins to assume its wonted form. 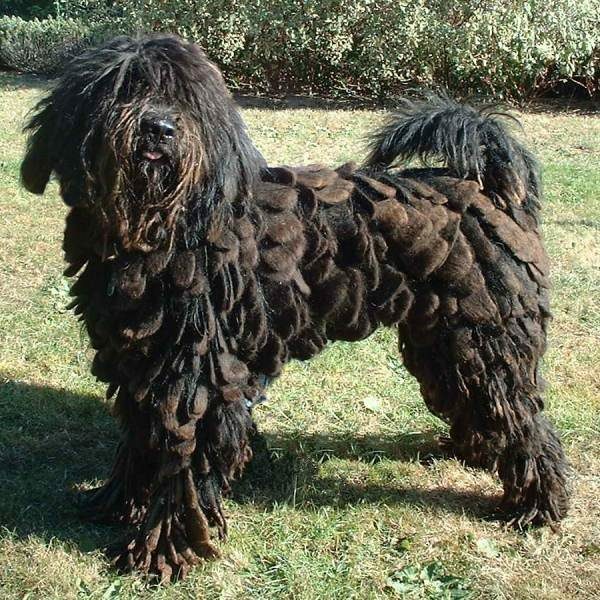 By the age of 5, a Bergamasco’s coat reaches its full length and texture. The accumulation of mats and cords serves a number of useful purposes. They regulate the dog’s body temperature, guarding it against bracing Alpine cold and summer heat. For their own part, the scaly-looking mats not only resemble the skin of lizards and armadillos, but also serve the same protective function. Where most sheep dogs depend on size to intimidate predators, the Bergamasco’s coat also serves as a kind of follicular body armor. Cording and matting is natural for the Havanese, but can be more problematic for this smaller dog breed. The process of matting is shorter for Havanese dogs; their coats can be a mess of matted fur within only two years. This is a breed for whom cording should be managed by a professional groomer or a well-practiced hand. Havanese require consistent, if not daily, brushing to keep mats and cords from forming on their own. For longtime Havanese owners, coat maintenance is less like grooming and more like cultivating a vineyard or trellising tomatoes; it takes a certain amount of skill and dedication. Since these are small dogs, if they are allowed or encouraged to produce carefully tended dreadlocks, having shorter hair than the Bergamasco means they’re relatively easier to bathe and dry. No matter how thickly knotted their coats, Havanese are always heat and cold sensitive, so their cording tends to be an aesthetic choice. Originally hailing from modern-day Hungary, the Komondor is the breed most casual dog aficionados associate with thick, low-hanging dreads. 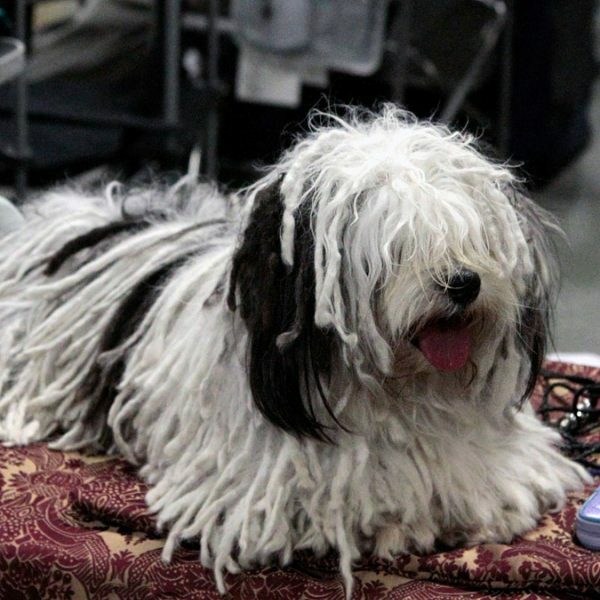 Like its Italian cousin, the Hungarian mop dog is a working breed, known for its ability to herd and protect livestock. The long, thick cords that cover the body take a couple of years to come together naturally. They offer insulation from extreme cold and weatherproofing during heavy rains. Beginning around 9 months of age, the Komondor’s trademark cords start taking shape. Domestic Komondorok (the appropriate pluralization), who may be less active than working dogs, are at more risk of tangling and matting. Since their coats tend to attract debris both inside and outside of the home, experienced owners know that properly grooming the cords one of a mature Komondor is a job that demands patience and no small amount of skill. 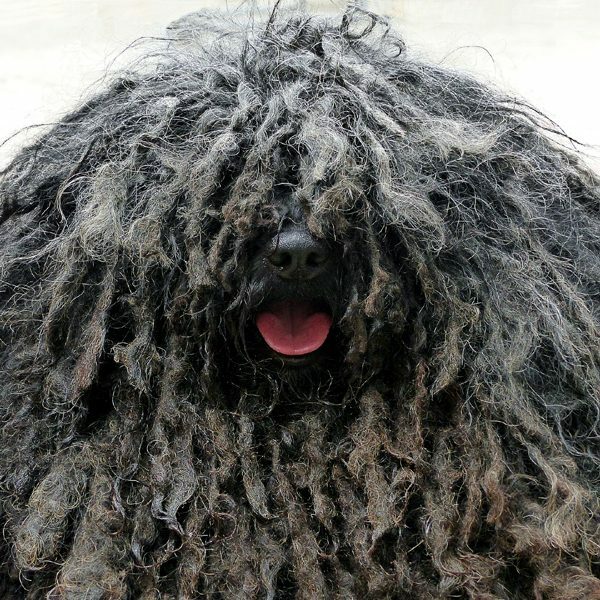 Bathing a dog whose dreads have grown to their full length can present special problems, since drying them haphazardly or incompletely after a bath can lead to a unpleasant and lingering odor. A Hungarian breed, like the Komondor, Puli are decidedly smaller and faster dogs. 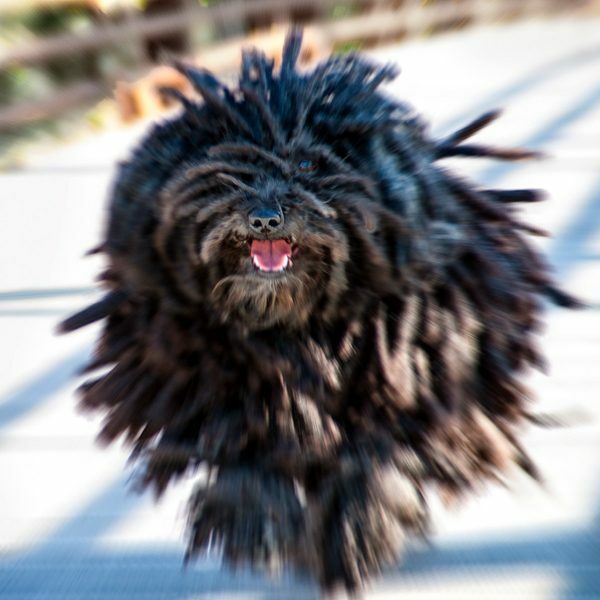 Diet, conditioning, and overall health impacts the formation of the Puli’s cords. If the dog’s two coats do not grow at a similar rate, its cords may not come together at all, or be weaker than normal, with a tendency to fall off of the body when they grow too voluminous. Rather than allowing their dogs’ dreads to reach their natural length, some Komondor and Puli owners keep the work of maintenance to minimum by periodically clipping the cords. Shorter coats also put these mop dogs at less risk of matting and tangles, as well as shortening the time needed to dry after baths. Among all the breeds we’ve covered, the curly-coated Poodle is the one dog who tends to look more like a lamb than a mop. Poodles are one of the most fastidiously-groomed of all dog breeds. From puffed tails to pompadoured heads, Poodle presentation has become a fine art. Until the early 20th century, followers of the dog fancy assumed that non-corded and corded Poodles were distinct breeds. In 1890, one of the earliest dog show champion Poodles was a dreadlocked dog named Achilles. Much more common in the 19th century, conformation shows are the most likely place to find a corded Poodle in the 21st, due to the extreme amount of work it takes to keep up appearances. Here ends our survey of mop dog breeds! Have you ever owned one of these dogs, or tried to cord your own dog’s coat? Tell us about your experiences in the comments! 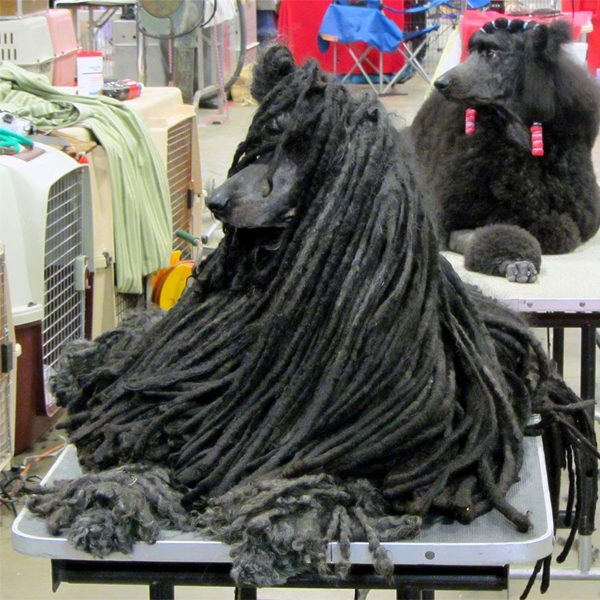 The post Dogs with Dreads: A Survey of Mop Dog Breeds appeared first on Dogster.